Sohaiyla Khalili started her dance training at Charlotte Klein Dance Centers when she was four years old, and was a member of the Charlotte Klein Dance Company. There, she received her formal dance training and worked with a large number of accomplished choreographers. She spent summers training with The Rock School for Dance Education, Dance Masters of America, and Walnut Hill School for the Arts. Sohaiyla recently graduated from The University of Massachusetts, Amherst with a BS in Chemical Engineering and a minor in Chemistry. While at Umass she continued her dance training under the direction of Billbob Brown and worked with a vast number of renowned choreographers and performed frequently. She is currently dancing with BoSoma2 Dance Company; A contemporary dance company located in Boston. 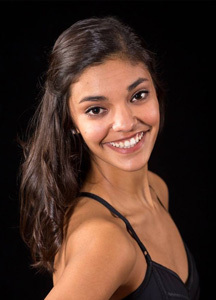 Sohaiyla is thrilled to be choreographing for Charlotte Klein Dance Centers and is eager to share her passion for dance with younger generations.